On Saturday, March 19th, in cities all over the world Wing Chun practitioners will be planning events to promote the art of Wing Chun in all its forms. The day educates millions worldwide about Wing Chun's benefits and raises awareness about local classes. These forms include its many spellings, lineages, modifications and evolutions including Wing Tsun, WingTsun, Ving Tsun, Jeet Kune Do, JKD, Weng Chun, Yong Chun, Jun Fan Gung Fu, Hung Fa Yi, Shaolin Wing Chun, Wing Tzun, Wing Tjun, Vinh Xuan, TsunJo Wing Chun, Wing Chun Do, Xiong Jiang Wing Chun and many more. It is a good idea. Keep me informed. I will plan a wing chun event in Barbados. annuinstitute@hotmail.com. Comment from Rob@WingChunLife: No problem Ricardo, just check back here for updates and let us know your plans to celebrate this year. By the way, you might like to create a page for your Wing Chun school in Barbados on our Wing Chun schools page. I can understand your frustration. My sifu wasn't really prepared and missed out on a good opportunity... this year. According to the International Wing Chun Day organizers/founders [and I paraphrase]: This is the 2nd annual celebration [so it's new and young]. Many more people spread the news about it online and did participate in it this year than last year. So it's growing, as it should. As an aside... you don't have to rely on a kwoon to help you celebrate next year (it's a good idea from a business sense that all kwoons take advantage of this) you can organize your own events, even among friends and family. Wing Chun has grown and spread around the world because of enterprising sifus who each took independent steps forward. There was no bureaucratic corporation or "Nanny State" government body that "forced" its evolution. Keep that in mind. 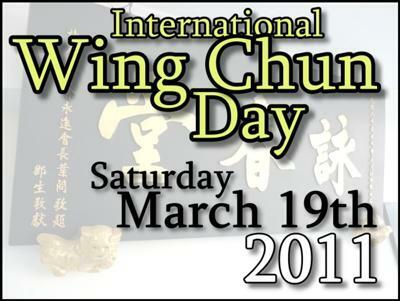 Int'l Wing Chun day ? It is a crying shame that I cannot find even one school in the UK which has publicised what event it is holding for this day ! Try googling it and you will see what I mean. We are having Wing Chun practitioners from different lineages come to train together to celebrate International Wing Chun Day. After training we'll be going out for lunch. I'm promoting this event online through the website, mailing list, blog rss, twitter and Facebook. I'm also helping other Wing Chun practioners promote their International Wing Chun Day events and spreading the message worldwide. Then I'm training that day with my kids, maybe at the beach.